Multiple stories of violent events appeared in the edges of the press yesterday: a mosque bombing in Syria, bombings against police in Bahrain, and a particularly vicious "knockout" attack in Cleveland. Only the first appears to have been fatal, and it occurred in a region already torn by violence. So we're looking for a weaker version of the Bloodbath Formula. 1. Pluto trine Pallas. A bit weak, but present. 2. South Node on the final degree of its journey through Taurus. Venus near the midpoint of both her ruler Saturn, and Neptune. Also a bit weak. 4. 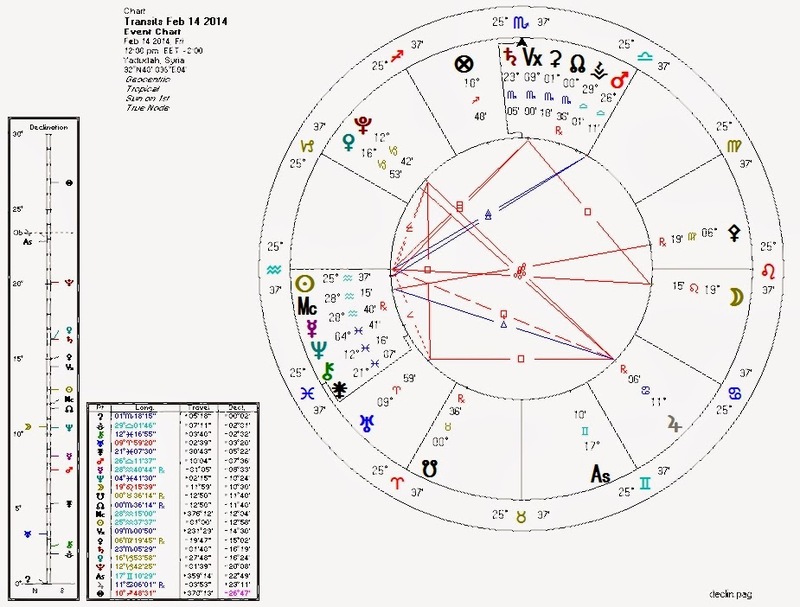 Moon ruled by Sun which is configured with Pluto (see below). 5. Pluto at the midpoint of the Sun and its ruler Saturn, and novile with both. Also Pluto square Uranus, the other co-ruler of the Sun. The last two points seem to be the trigger. Note that we are seeing less violence (physical and political) as Pallas moves away from the aspect with Pluto.